Ahmedabad Management Association, Nr. IIM-A, Ahmedabad, Gujarat. 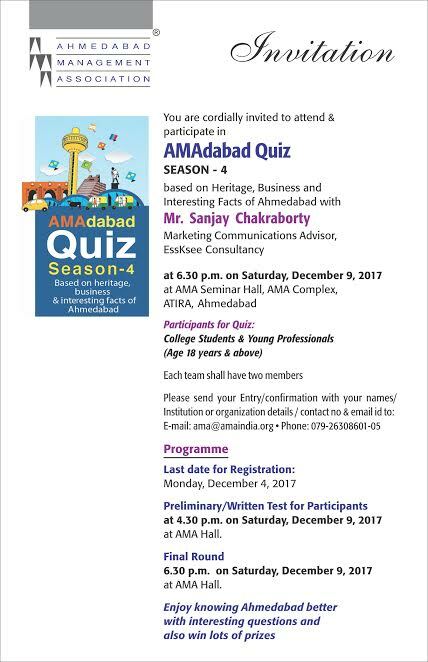 Attend & participate in the 4th edition of AMAdabad – QUIZ based on Heritage, Culture Business, Brands & facts of our great Ahmedabad with Quiz Master Sanjay Chakraborty. Participate & get the chance to win loads & loads of prizes.Organised by Ahmedabad Management Association.